… was a question I got today from one of my ANSC*4090 undergraduates (they’re each planning and writing a six page review paper). “Twenty three” I replied, deadpan. … why don’t WE have a lion? 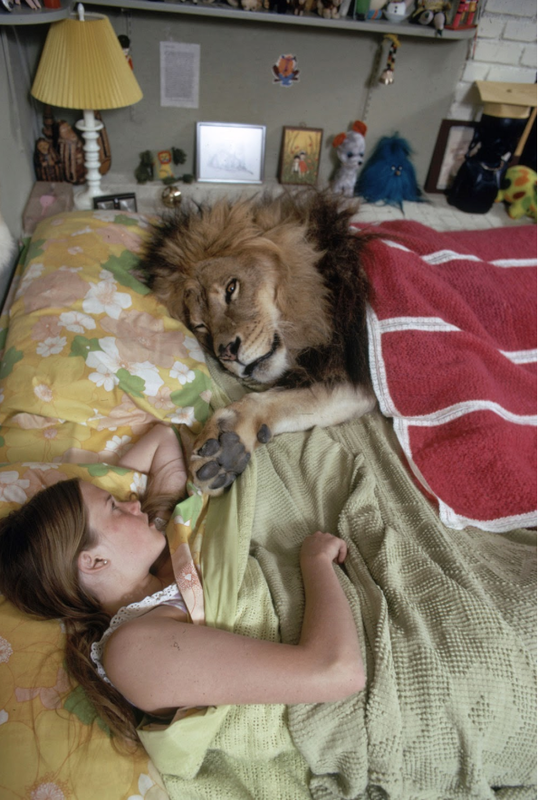 In the 1970s, actress Melanie Griffith (not Griffiths, confusingly, so not snub-nosed star of Sleepless in Seattle) adopted Neil, a huge African lion. Here is a collection of excellent photos showing his daily life in a 70s Hollywood home. 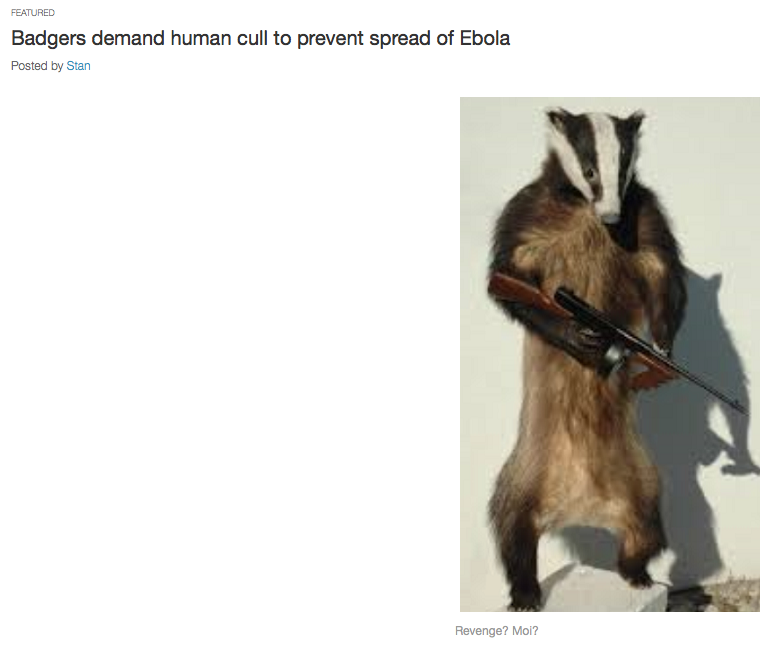 Walter and Jamie managed to make Rob Hampton‘s seminar the other week (the visit that sparked the fun GTA Animal Cognition meeting), and Jamie’s great write-up is below. I wondered about the role of affect in “metacognition” too: do animals know what they know, or just have a sense of unease in some situations, making them risk averse? Could Walter’s data on the use of affective states as discriminative stimuli be more than a clever lab phenomenon: maybe we use affective states as DSs to make ‘cognitive’ decisions? I went to an interesting talk at the University of Toronto’s psychology department on Friday Oct. 3rd. Robert Hampton presented data from years of research on metacognition in monkeys. He initially devised a test in which monkeys stand over a number of tubes and have to choose the correct one to collect the treat inside it. They show evidence of knowing what they do or don’t know by bending down to peek into the open-ended tubes most often if they haven’t seen the experimenter bait the tube (when experimenter did so behind a screen). This was a neat demonstration, but what really allow him to fasttrack this research was the automated version he and student Ben Basile came up with years later. In this version, monkeys can click a touchscreen to demand a “peek” at the correct answer in a discrimination task. They do so more often if they weren’t already shown the answer for free. They could now much more easily vary the cost of peeking (by requiring more or less touches, titrated to each individual monkey’s persistence), investigate whether the monkeys show metacognition in visual as well as spatial discriminations (yes). I wondered about the role of affective states in metacognitive evaluations. Thinking about the cognitive bias literature, is a sad monkey more likely to pessimistically assume she doesn’t know than a confident, happy monkey? I asked Hampton about whether they’d ever checked whether being on a “hot streak” or on a “cold streak” affects how likely they are to ask for a clue. Sadly, not yet! Maria went to a great talk a week or two ago. Sad I couldn’t make it. Here’s her report. 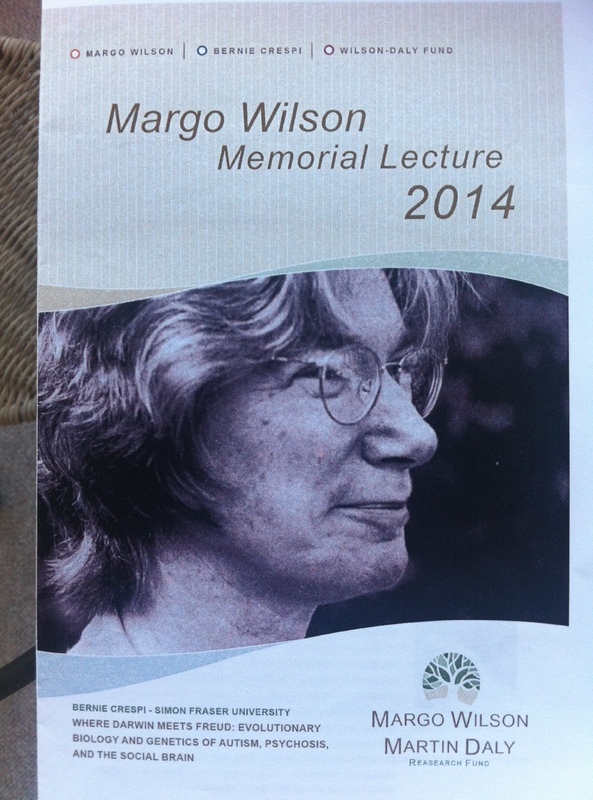 The Margo Wilson memorial lecture at McMaster this year had the enticing title of “Where Darwin meets Freud: evolutionary biology and genetics of autism, psychosis, and the social brain”. It was delivered by Simon Fraser University’s Bernie Crespi and he did not disappoint. He presented what he calls “the diametric model”, an evolutionary framework for understanding mental disorders. This model posits that autism and psycho-affective disorders (e.g. schizophrenia, bipolar disorder, depression) are the result of the evolution of the “social brain” (understood as social skills – language, sense of self and empathy – as well as technical skills – visual, spatial and abstract skills) and they represent diametric opposites of evolutionary spectrum of this trait. In this sense, autism would represent a dial down of social skills and dial up of technical skills, while psycho-affective disorders would represent a dial up of social skills and dial down of technical skills. He then presented us with the predictions of the model and the evidence that has been found so far on diverging phenotypes in terms of social brain between autistic humans and humans with psycho-affective disorders (e.g. autism is more frequent amongst technology majors and psycho-affective disorders are more common in the humanities; autistic humans have reduced activation of mirror networks while the opposite is true for schizophrenics), as well as evidence on diametric genetic basis between these two types of disorders (fascinating stuff on parental conflict over fetal genetic makeup). As expected, most of the questions he got were to do with co-morbidity of the disorders and the negative aspects of autism and schizophrenia and depression (and personally I don’t think he had any great answers). Overall, his talk reminded me very much of the one Paul Andrews (who was there, by the way) gave last year at a CCSAW seminar on the evolutionary basis of depression. After the question round we joined the speaker for wine & cheese (yum). I was with UoG Pat Barclay and his fantastic group of grad students (thanks for the lift! ), and we managed to corner the speaker and started bombarding him with questions (he had wine, so all was good). Most interesting from that discussion: a Swedish study just reported that, while humans with psycho-affective disorders do not have reproductive advantages compared to “normal” people, their sisters do. Which interestingly enough, is the same pattern found for sisters of homosexuals. Unfortunately they did not look at patients with autism in that Swedish study, but I need to get a hold of that paper! So in short, McMaster hosted another great talk. My friend Sarah Boston’s book is still doing brilliantly, as it well deserves to. 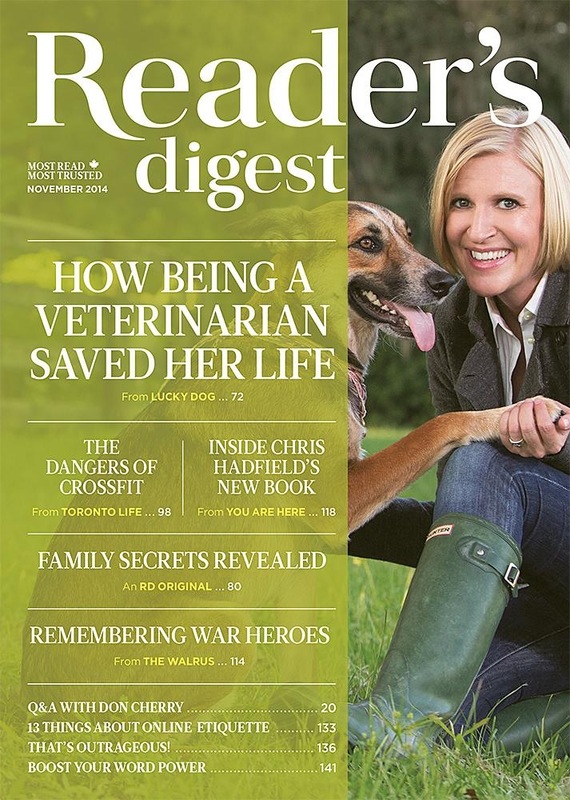 She was on CBC’s The Current, and now graces the cover of Reader’s Digest: see below. By amazing coincidence , my good friend Elena just sent me this cute vid from La Stampa.